We love a rich, moisturizing body scrub. Unfortunately, exfoliating in the shower can take circus-like stability to avoid slipping on the layer of oil that many body scrubs leave all over the tub. 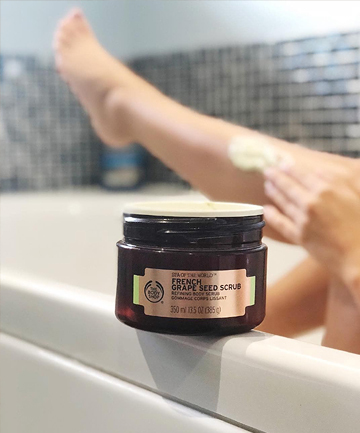 That's why an excellent scrub must have great balance, too: the right ratio of skin-sloughing properties to moisturizing elements, and an amazing fragrance that is energizing, yet relaxing enough to make you feel like you've stepped into a luxury spa. Sound like a tall order? That's why only 17 body scrubs made the cut. Click through to see which reader-reviewed products stand up to the challenge. I really want to try one of these scrubs. They all look like good products. It all sounds so good. I wanna try them all. I have tried every exfoliating product on the market some worked , some broke me out! But My sister and I have found one that has changed our lives. It's called Spa-Exfoliare Whole Body Bath Net,It's awesome. I had severe eczema all my life and had these really ugly thick patches on my feet. I never wore sandals until this summer! It is changing my life. Its such a simple tool. It caught us both by surprise. I think it's the best kept secret. I got mine from their site but my sister went to Etsy. I even had better tans this summer because my skin tone was more even. It surprised us that we couldn't find them at our local stores, but I tell everyone I know because it really works! and they don't use chemicals! I love my Bath net, you've got to check them out! "Tree Hut" makes a fantastic sugar scrub in a variety of scents and it's very affordable! I recently purchased the Bath and Body works True Blue Spa Invigorating Spa Scrub, for which I paid $24.00, and I prefer the Tree Hut stuff, which is under $10.00! I've tried the Bath and Body Works products mentioned, and love them! Can't wait to try some of these others. i am obsessed with body scrubs i had been curious about some of these and now i know i should try them! I have used many of these scrubs and they are all awesome. Favorite for sure would have to be The Body Shop scrubs. All of them. Very different smells, work wonders, and a great store for the environment so I don't feel guilty! What about scrubs that aren't so strongly scented? I realize that most are "salt" or "sugar" scrubs, but do they actually have to smell overpoweringly salty or sugary? Another option for people looking for a great scrub is to look on etsy or at local soap maker shops. You can get amazing scrubs that contain fewer chemicals and are a fraction of the price. You can check out my scrubs on etsy by searching Scrubxury.